I so, so, so want to make something from my new copy of Wahaca: Mexican Food at Home by Thomasina Miers, but because I'm a) supposed to be on a diet and b) didn't get the book before I booked my Ocado order about two weeks ago, I've been left with basic store cupboard ingredients. I have feta cheese and avocado and flour tortillas, which I'm sure could go a long way towards trying one of the recipes, but it would most likely equate to my entire daily food allowance. So I'm just making do with longingly reading the book. According to a recent study that I read about in the Daily Fail Online, adventurous eating makes us fat. Bland, predictable and repetitive food is the key to slimming because nobody really cares to eat more of that kind of food than they need to sustain them and satiate any hunger. Which is probably why I've struggled to lose weight doing this challenge. Baking aside, I know I've not been consistently good - mostly towards the end of the week when I'm exhausted from work and motherhood and just cook something new for the sake of cooking something new and blogging about it. Day three of the current diet and the food has still been pretty bland. I managed to sort myself out with a low-calorie prawn wrap for lunch (stuffed with little gem lettuce and thinly sliced radishes) that was very tasty and breakfast is consistently bircher muesli or a protein bar, but teas are still proving to be a little bland. Take tonight's recipe from the BBC Good Food website. I picked it for being low calorie, simple and something that I knew that we could all eat with varying accompaniments. It was easy to prepare, using all storecupboard ingredients (except my addition of fresh parsley to give it some colour) and I ate mine with a mountain of vegetables. The crumb was tasty - I used garlic puree for laziness and to save my hand from smelling. 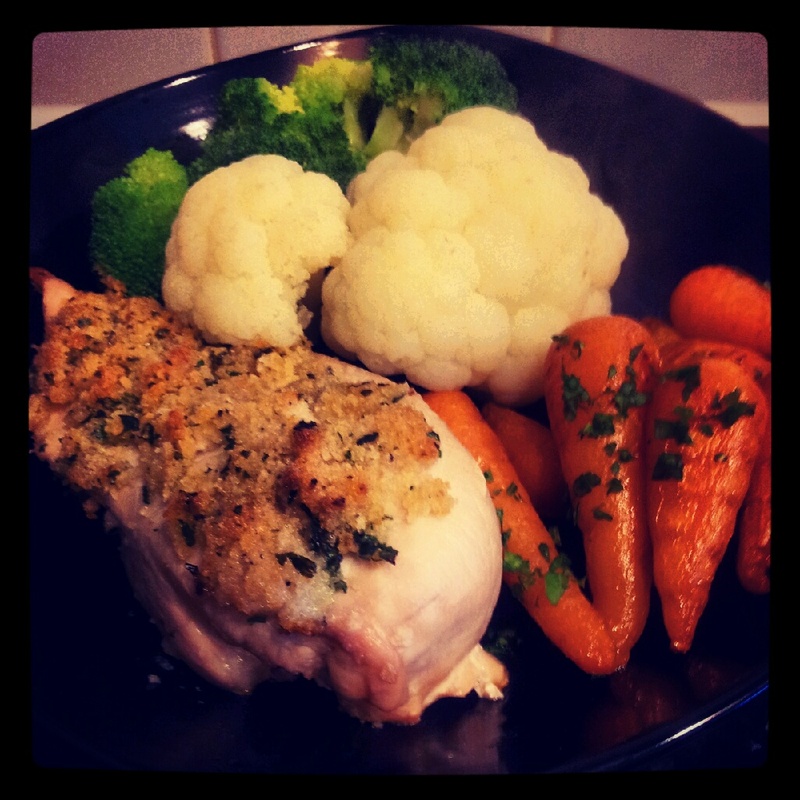 But the chicken was still bland, as was the cauli and broccoli. The carrots, however were great. I'm not a massive fan of boiled carrots unless they're accompanying a roast and under a significant puddle of gravy. I'll eat them by the bucket-load if they're raw. Or if they're cooked Vichy style - thinly sliced then cooked in a tiny amount of water with butter and a little sugar to make a glaze - so not a vegetable I would normally buy given that we never eat roast dinner at home (apart from Christmas day). But tonight, I picked up a bag of tiny Chantaray carrots in Waitrose, tossed them with a little olive oil and baked them alongside the chicken. Yummy. Place the chicken breasts on a baking tray and make two diagonal slashes in each, cutting about 2/3 of the way through the flesh with each slash. Season with salt and pepper. Mix the butter, breadcrumbs, garlic and parsley. Divide between the tops of the two pieces of chicken. Toss the carrots in the olive oil and add to the baking tray.